Assassins Creed is a popular HD Mobile game created by Gameloft Inc. The game’s plot is based on the Templars and the Assassins. The main character of the game is Desmond Miles, who was using a machine that reads the memory of ancestors of the DNA – Animus re-experiencing the events of the past. His main goal is to find out the hidden particles of Eden and get them to the Templars to prevent doomsday. In the game you are Native American assassin who has descended in that era from the British Empire. It is 18th century and is one of the darkest times of the history. There is a conflict going on between the British and 13 American colonies. The former have become ruthless and destroying every village coming in their way. Now your village is one of them and sooner or later there will be a confrontation. You are the biggest hope of the resistance and to succeed you need to pick up the weapons. So you will be assassinating many important personnel of the enemy camp throughout the game. To assist you in this endeavor, there is a huge lethal arsenal at your disposal. You can use them selectively to wage war against the mighty British. Some of them include tomahawk, high precision arrows, revolvers and the classic Assassin’s Blade. You are free to engage into one on one war as well as naval battles. In case of latter, you will be captaining a whole ship and a crew will also be there, ready to strike at the order of you. The British naval fleet is of course much stronger and you will have to devise a superior strategy to defeat them. This is a unique feature of Assassins Creed HD which is not available in the previous versions. The game is a wonderful experience for the action and thrill gaming aficionados. The game play is brilliant and graphics are amazing. Assassins Creed HD can be played on various Nokia platforms like Belle, Anna and Symbian. The game runs flawlessly on these platforms and is a treat for the nokia phone users. Game Price in India: 15 Rupees. 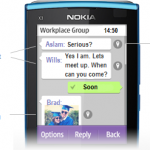 [*] We have tested this game on Nokia N8 Belle. If you are looking for more HD games then don’t forgot to check out our Games Section. 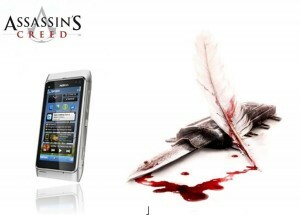 Hope you have a great time getting your hands of Assassins Creed for Nokia. Believe me, Assassins Creed HD is so addictive that you will forget your Nokia is actually a phone!